DHS confirms that passengers on U.S.-bound flights from 10 airports will not be allowed to bring electronics larger than a cell phone on board. UPDATE 3/21: The Department of Homeland Security on Tuesday confirmed that it will ban electronics larger than a cell phone on flights to the U.S. from 10 specific airports. All passengers on these flights, regardless of nationality, must check their larger gadgets in their luggage; devices cannot be brought onboard. Airlines were notified at 8 a.m. ET today; they have 96 hours to implement the ban, which will remain in place indefinitely, DHS said. "We have reason to be concerned about attempts by terrorist groups to circumvent aviation security and terrorist groups continue to target aviation interests," DHS said on its website. "Implementing additional security measures enhances our ability to mitigate further attempts against the overseas aviation industry." Affected airports include: Queen Alia International Airport in Amman, Jordan; Cairo International Airport; Ataturk International Airport in Istanbul; King Abdul-Aziz International Airport in Jeddah, Saudi Arabia; King Khalid International Airport in Riyadh, Saudi Arabia; Kuwait International Airport; Mohammed V Airport in Casablanca, Morocco; Hamad International Airport in Qatar; Dubai International Airport; and Abu Dhabi International Airport. Outbound flights to these airports are not affected. "The new procedures remain in place until the threat changes," according to DHS. "These are risk-based decisions and TSA continuously assesses security risks and seeks to balance necessary security requirements with their operational impact on the industry. "As threats change, so too will TSA's security requirements," the agency said. It appears larger smartphones, or phablets, will be allowed. "The size and shape of smartphones varies by brand. Smartphones are commonly available around the world and their size is well understood by most passengers who fly internationally," DHS said. As for why now, DHS says its "information indicates that terrorist groups' efforts to execute an attack against the aviation sector are intensifying. "We note that disseminated propaganda from various terrorist groups is encouraging attacks on aviation, to include tactics to circumvent aviation security," the agency said. "Terrorist propaganda has highlighted the attacks against aircraft in Egypt with a soda can packed with explosives in October 2015, and in Somalia using an explosives-laden laptop in February 2016." Passengers could soon be prohibited from traveling with large electronic devices on some U.S.-bound flights due to a ban that appears to be instituted by the U.S. government. 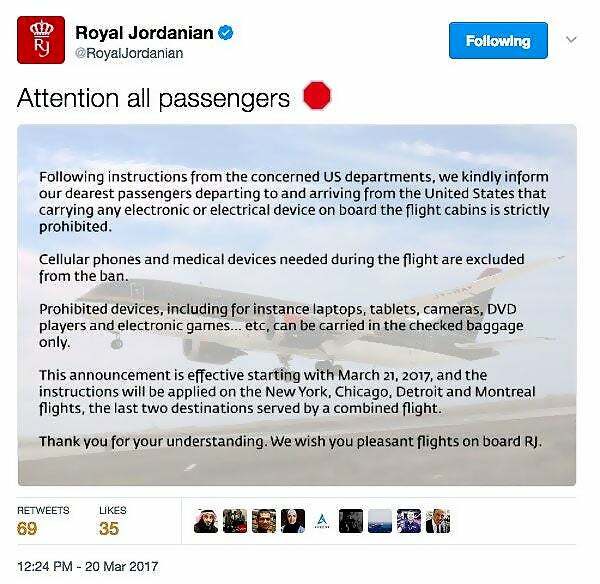 The new rules surfaced in a now-deleted tweet on Monday from Royal Jordanian Airlines, which said that starting March 21, passengers are not allowed to bring any "electrical or electronic device" other than cell phones or medical devices on board the company's flights to the U.S. It would affect flights flying into New York, Chicago, Detroit and Montreal, the tweet said. Royal Jordanian said it was following "instructions from the concerned U.S. departments" and would ban "laptops, cameras, DVD players and electronic games" from the flight cabins. Royal Jordanian did not immediately respond to a request for comment. When asked on Twitter why its initial tweet had been deleted, the airline responded that "further updates will be announced soon." A spokesman for the U.S. Department of Homeland Security declined to comment. "We have no comment on potential security precautions, but will provide any update as appropriate," he wrote in an email. According to The Guardian, airlines from 13 countries will be caught up in the ban, including Saudi Arabia's Saudia Airlines. The airlines were informed via a confidential email distributed by the Transportation Safety Administration (TSA), which The Guardian suggests was supposed to be kept quiet, perhaps prompting Royal Jordanian to delete its tweet. Saudia did not immediately respond to a request for comment. Other than an exemption for cell phones, the ban's specifics aren't clear, although it appears to be up to the airlines to ensure that passengers on affected flights don't have any of the banned electronics in their carry-on luggage. As airlines install Wi-Fi on more aircraft, laptops and tablets are gaining usefulness in the air, and many carriers have been using tablets to replace the heavy navigational charts and other paperwork that their flight crews were formerly required to carry. It's unclear if those tablets would also be subject to the ban. The news comes shortly after a U.S. court struck down President Donald Trump's revised travel ban.